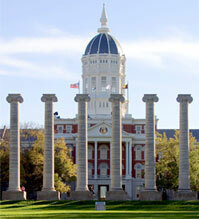 The Mizzou Alumni Association (MAA) has announced the recipients of the 2012 Geyer Public Service Awards. Award recipients are Missouri State Sen. David Pearce for his continued efforts to support higher education public policy and MU students Steven Dickherber, Zach Toombs and Ben Levin for their advocacy efforts on behalf of the student-run “More for Less Campaign” in 2012 to protect state funding for Mizzou this year. The MAA’s Legislative Network Committee (MLN) annually presents the awards to one state-elected official and one citizen or group of citizens who exemplify the dedication and spirit of Henry S. Geyer. A former state representative, Geyer believed education was the key to progress and prosperity in Missouri and introduced a bill to establish the University of Missouri in 1839. Sen. David Pearce, a Republican, represents District 31 in the Missouri Senate, which covers Johnson, Cass, Bates and Vernon counties. Pearce and his family reside in rural Warrensburg. He was elected to serve in the Missouri Senate in November 2008 after completing three two-year terms in the Missouri House of Representatives. Pearce serves as chairman of the Senate Education Committee, the Educated Citizenry 2020 Committee and the Joint Committee on Education. Pearce was appointed to serve on the Missouri Veterans Commission in August 2009. He also was reappointed to the Midwestern Higher Education Compact in September 2010, and was honored to serve again as an Executive Committee member. In addition, Pearce serves as a member of the Senate Committees on Appropriations and Jobs, Economic Development and Local Government. He also serves as vice chairman of the Senate Veteran’s Affairs, Pensions and Urban Affairs Committee. Pearce has been recognized for numerous legislative achievements including the MU Alumni Alliance Award. Pearce received a Bachelor of Science degree in agricultural journalism from the University of Missouri. Missouri Students Association leaders Steven Dickherber, Zach Toombs and Ben Levin were the creators of and the driving force behind the 2012 “More for Less Campaign,” which adopted the goal of helping secure level funding for the Missouri state higher education budget. An additional goal of the campaign was to increase Mizzou students’ awareness and understanding of the fiscal challenges that further cuts in funding would create for the state flagship university in maintaining its higher education objectives for instruction, research, outreach and economic development. The student campaign effort delivered 6,000 student letters to the governor’s office and Missouri General Assembly in February as well as brought four buses full of MU students to the state capitol building in April. The movement was deemed an overwhelming success when the General Assembly passed the level-funding budget for higher education, which Governor Nixon signed this past summer.